As cameras recorded the event, the one-ton State Capitol Rotunda chandelier was lowered Tuesday evening for the first time since 1979. Officials said the chandelier was lowered to prepare for work on the Capitol dome that will begin this fall, and said the chandelier appeared to be in good shape with all 92 of its heavy-grade light bulbs still working. 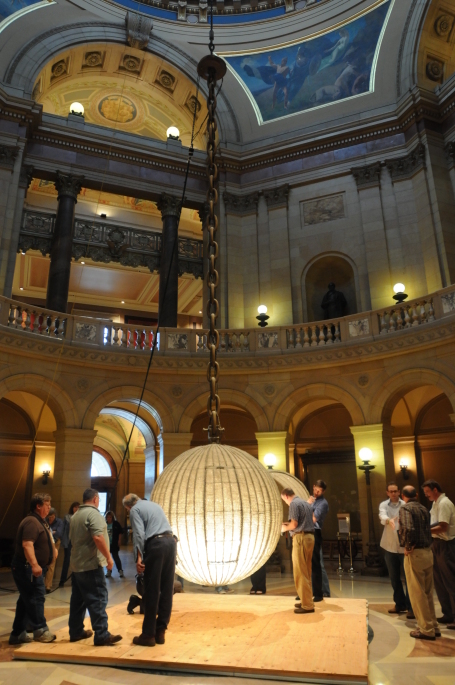 A small gathering of officials from the Minnesota Historical Society watched as the crystal chandelier was lowered 142 feet from the top of the rotunda to just above the rotunda floor. "It's just dirty, dusty," said Brian Pease, site manager of the State Capitol for the state historical society. After a quick inspection, the chandelier was raised back up to the ceiling. It will be lowered again this fall, and cleaned over a three-to-four-day period. Pease said Tuesday's exercise was mainly to see how easily the chandelier could be lowered. "This was basically just a trial run," he said. The chandelier, which is just over six feet wide, was installed at the Capitol in 1904 -- Pease said Tuesday's lowering was likely just the third or fourth time it had ever been lowered. The chandelier is only lit on special occasions -- on statehood day each year, when a new governor is inaugurated, when the body of a notable person is lying in state in the Capitol rotunda and for other rare events. Pease said the chandelier is probably lit only 50 to 60 hours annually.